Belgian colonists indeed cultivated King Leopold’s slave state. And they built field stations for studying how to increase productivity of their export goods. At Yangambi they tinkered with improving rubber, an early economic mainstay. By the mid–20th century the colonial government had transformed the site into Africa’s leading institute for scientific research on agriculture and forestry, then called INEAC, the Institut National pour l’étude Agronomique du Congo Belge (today known as INERA, or Institut National pour l’étude et la Recherche Agronomique). A staff of 12,000, including several hundred scientists and technicians, toiled in scores of stately brick buildings and tended an experimental plantation the size of Washington, D.C., which developed internationally important varieties of oil palm, rice and Yangambi km. 5, a disease-resistant banana cultivar. 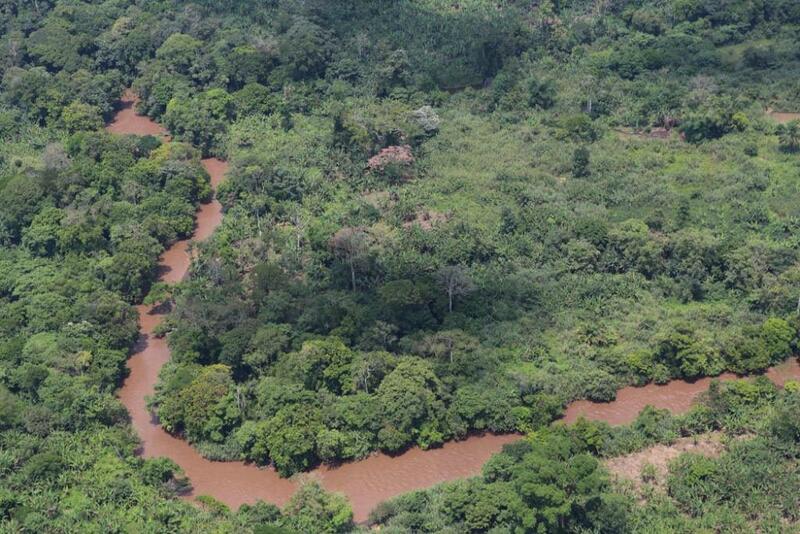 A forest reserve 10 times larger encircled the busy complex. It’s here that two researchers are working on separate projects to try to better understand how the Congo rainforest, second in size only to the Amazon, will respond to climate change—and in turn, impact climate change through possible changes to the forest’s ability to store carbon. The site’s not what it once was. Today, the facility runs on a fraction of the budget it had last century, and a very small Congolese staff works to preserve what it can from the past — such as a huge collection of dried plant specimens at the site — and to investigate methods for improving farming and forestry. INEAC's research plots have nearly all reverted to forest. For the most part, its laboratories have been emptied. So, too, its restaurant, where INEAC's European elite once danced on a veranda overlooking the Congo River. Emmanuel Kasongo Yakusu, who teaches forest management at the University of Kisangani, says the site’s budget gradually dwindled after the Congo gained independence in 1960. “It’s sad,” he says. Civil wars engulfed the town, most of the staff left, and much of Yangambi dissolved back into jungle. Before a trip I took to the area last February, a Belgian scientist had encouraged me to keep my eyes out for the remains of the recreational complex that included a 300-seat cinema, a bowling alley and a huge pool. Today, “not even a frog can swim there,” he’d said. I traveled to Yangambi with Wannes Hubau, a forest ecologist who works at Belgium’s Royal Museum for Central Africa. He was trying to find data to help understand how the forest might influence global climate in coming years. He was conducting a tree census, an arduous tally of the amount of carbon stored in a forest. Such studies have been performed in forests all around the world. They offer accurate, standardized data on how trees have responded to climate change. However, few have been done in the Congo rainforest. Fewer still have been repeated over time at the same Congo site, a necessity for computing change. Political strife, war, corruption and poor infrastructure hinder surveys there. In fact, Hubau had almost cancelled our trip, concerned about violence after Congo president Joseph Kabila refused to retire when his term expired in December 2016. But a last-minute political truce calmed the country and allowed Hubau and me to travel there safely. Then, beginning in late 2015, a record-breaking El Niño brought widespread drought to Africa. Hubau and his Central Africa museum colleagues realized that the El Niño created a natural experiment, roughly standing in for future drier conditions in the Congo forest, which some research suggests will come to pass, and may already be occuring. A third census in Yangambi would help to reveal how the forest reacts to drought, and would suggest whether the Congo’s carbon-hoarding capacity will halt later this century. Globally, forests hold roughly 360 billion metric tons (400 billion tons) of carbon in living biomass, including trunks, roots and branches of trees. That’s nearly 40 times more than the amount humans discharge annually as carbon dioxide from tailpipes and smokestacks. A small difference in forest growth could greatly change CO2 accumulation in the atmosphere, affecting how much climate chaos we and our successors will suffer. And since tropical jungles are the planet’s largest reservoirs of forest carbon, changes to them especially worry scientists. Reduced rainfall and anticipated warmer temperatures could stall Earth’s carbon storage machinery. Meanwhile, Hubau’s colleague Koen Hufkens, a biologist at Ghent University, is trying to help answer the question of how the Congo rainforest will respond to variation in rainfall in the coming decades using completely different methods. Without realizing it, as I drove through Yangambi, I drove right past the herbarium where in 2013 Hufkens had unearthed a half-century-old cache of documents containing thousands of meticulous daily observations of when 2,000 jungle trees had flowered, fruited, leafed out and dropped leaves from 1938 to 1958. When Hufkens came across the documents, they were wet and moldy from rain falling through holes in the roof. Hufkens hopes to correlate the 20 years’ worth of data with weather patterns, such as bouts of drought. “Were they leafless for longer?” he asks. “Did they fruit?” But first he had to solve a more mundane problem: how to convert the handwritten records into a digital form useful for modern science. Hufkens scanned the 20-year collection, but it was too extensive for him to transfer the observations it contained into a spreadsheet by himself. While working at a lab at Harvard, he stumbled across Zooniverse, a website that enlists online volunteers to help scientists perform tedious tasks. Hufkens digitally sliced up a copy of the INEAC records into thousands of postage-stamp-size photos. Zooniverse’s digital tools made it possible for its posse of citizen scientists to transcribe information in each photo into a computerized form even if they only had a few moments at a time to spend on the work. The information would later be assembled into a complete data set. Some 8,000 volunteers contributed, working an average of 90 seconds per visit on something that Hufkens estimates would have taken him a year to complete working full time. “That’s the amazing thing about crowdsourcing,” he says. The anonymous helpers ended up contributing about three years of full-time work. As a check on accuracy, Hufkens assigned 10 individuals to process each image, which he says multiplied the work but reduced errors to near zero. The virtual team finished the job in a year. Before Hufkens can correlate changes in seasonal behavior of the Yangambi trees with contemporaneous weather conditions recorded by INEAC technicians, he hopes to explain anomalies in his data. He’s noticed that sometimes trees of the same species act very differently. One might drop its leaves every year, while another hardly ever. He says the unanticipated behavior may be due to the locations of trees. Individuals next to streams might respond to drought differently than ones on hilltops, for instance. He hopes to find a map of the study’s 2,000 trees somewhere in Yangambi’s massive archives. Hufkens is not ready to draw any conclusions from his data yet. But a similar study of records collected in a different part of the Congo rainforest raises concerns about the health of the forest. Camille Couralet, a French biologist, studied 10 years of observations made from 1948 to 1957. In a 2013 paper in the Journal of Tropical Forest Science she reported that trees tended to flower and fruit less during dry spells. Over long periods, such changes could lower a forest’s productivity, reducing carbon storage. She speculated that climate change might bring “major vegetation changes” to the Congo forest. The last time I saw Hubau he was swatting flies in one of his Yangambi plots, craning up at a massive tree — and like Hufkens, facing a logistical problem in measuring his data. Buttresses — natural supports akin to those that brace medieval churches — crenulated the tree’s base. A meaningful measurement of the girth of such trees must be made above these supporting structures, where the tree becomes a tapered cylinder. August Lola Dipo, one of Hubau’s local assistants, perched on the upper rungs of a wobbly ladder where the buttressing ended, far above Hubau’s head. The correct height for gauging the tree was up there somewhere. But the previous researcher appeared to have violated protocol and failed to mark clearly where he’d wrapped his tape measure, complicating Hubau’s task. His findings suggest that later this century the Congo might not moderate global warming as powerfully as today. I got an email from Hubau not long ago. He’d spent months working out kinks in the data, such as how to deal with trees his predecessors appear to have inaccurately measured. His results show that the forest had absorbed much less carbon during the recent El Niño. He says it’s hard to generalize about the whole Congo rainforest with measurements from this one site. His results will be considered along with other surveys underway. Still, his findings suggest that later this century the Congo might not moderate global warming as powerfully as today. Given the importance of tropical rainforests to carbon storage and therefore climate change, it’s vital for researchers to figure out how the second largest rainforest in the world will respond to variations in weather brought by a warming world. History and present-day findings are working together to search out answers, even in the face of some huge challenges — answers that will be crucial for us all. Daniel Grossman’s reporting in the DR Congo was supported by the Pulitzer Center on Crisis Reporting and the Frank B. Mazer Foundation.